FastLane Tek leases space on dedicated high end web and email servers located in a state-of-the-art data center originally built by MCI. The data center boasts 2 megawatt backup power generators, cooling and fire suppression infrastructure. We can host your website and email at these facilities and give you your own control panel for complete self management. Don’t have a website, or don’t know how to manage one? No problem, we have years of website development experience and can work with you to create your own custom look. 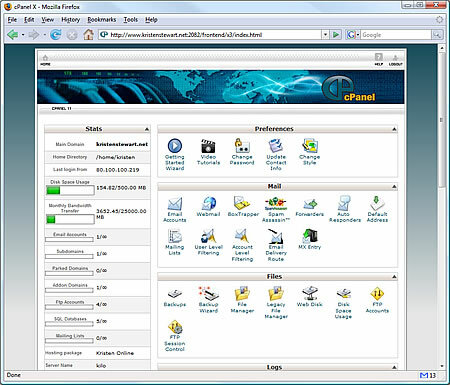 A cPanel website interface - available to all who host with FastLane Tek.